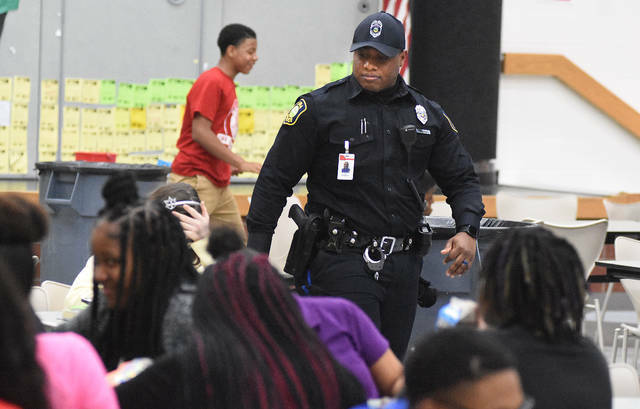 Lima Police School Resource Officer, D’Ante Barginere walks pass Lima West Middle School students during lunch on Tuesday afternoon. LIMA — It’s been a year since the Valentine’s Day murder of 17 students and staff members and the wounding of 17 others at Marjory Stoneman Douglas High School in Parkland, Florida. Since then, schools around the country have taken steps to beef up security. In this area, several schools have made great strides to improve the safety of the students and teachers. Many of the improvements deal with how people enter school buildings. “The number one thing that we’ve done: we put a kiosk system in where when you come in you have to bring your [driver’s] license in now. We know everybody who comes in and out of our building. So will that stop a shooting? No, but we actually have a better understanding of who is going to be in our building or not,” said Mel Rentschler, superintendent at Allen East schools. “Everybody wears name badges. We have secure entrances. We have sign-in/sign-out sheets. We walk visitors to and from their destinations. People just can’t roam the buildings on their own,” said Nate Garlock, director of safety and security at Lima schools. “One of the changes that took place after the shooting was we made sure that people could only enter through one entrance at the beginning of the day and not come in all of the different doors that are spread throughout the building so all of our students funnel through one place,” said Aaron Rex, superintendent of Wapakoneta schools. Other improvements to security go much deeper. Wapakoneta schools is considering a high-tech notification system. “We’re going to have someone come and do a walkthrough of the building, and this notification system would have strobe message boards, a software program that brings up a message on your computer that says we’re moving to a lockdown or there’s an active shooter in the building, and that would be on all of your desktops, all of your cell phones and instantaneously those things would happen right away so that’s something we’re looking to spend dollars on for next school year,” said Rex. Ottawa-Glandorf schools is also investing in equipment and materials. “We’ve upgraded our camera system. We’ve had 3M safety film put over a number of windows and door glass at all three buildings and we’re going to finish that project this summer. We are in the process of applying for a couple of grants to purchase additional safety equipment in the way of two-way radios and night lock door locks,” said Don Horstman, superintendent of Ottawa-Glandorf schools. Wapakoneta schools also secured their windows. “We had a film placed on all of the glass, so if someone were to come and try to break the windows out or even shoot through the windows, you can’t break that glass out once that happens so they couldn’t just get access to the building,” said Rex. Bath schools improved their cameras. “Last summer, we actually had our security cameras in our high school and middle school completely upgraded, brand new camera systems in those buildings to align with our elementary systems, so we’re all on one system and greatly upgraded the vision and what we see in those buildings. We also implemented the Night Lock system device. It’s basically a temporary barrier device that we put on every door in our district. When we go on a lockdown mode, we now have a little metal post that basically you put in behind the door and it goes into the ground floor,” said Rich Dakin, superintendent of Bath schools. Lima schools also rely heavily on cameras. “All of our buildings are equipped with security cameras, and there’s not too many spots throughout the entire district that if it’s on school property we can’t see it with a camera,” said Garlock. Training of staff and teachers is also part of the mix. “We’re an ALICE district, so all of our buildings and all of our staff members go through ALICE training. All of our new hires, it’s required that they do it right at the beginning of their employment, and then we make sure we circle back and we are annually getting people. That way they are never too far away from that training. We don’t want people that we train and then they haven’t had it in 10 years. We try to make sure that within every few years that people are at least getting some sort of refresher training,” said Garlock. “We’ve had all of our staff undergo extensive ALICE training. We’ve worked with the Sheriff’s Department [and] the Ottawa Police Department. We’ve had representatives from the Leipsic and Pandora Police Departments here, as well, working with our staff on ALICE training,” said Horstman. “In the fall, we did an evacuation drill. We brought in fire departments, sheriffs [and] state troopers. We brought emergency management in. We did a whole mock shooting in our school, and the kids were involved in it, and the sheriff’s department did a great job. They walked around and found all of the [security] holes in our building. Like for instance, when we were locked down, there were some windows not covered and you could see into the classrooms and you could still see some kids. We have all of the windows blacked out now. When we have a lockdown, you can’t look into our windows anymore. We have monthly drills now where scenarios pop up like an intruder or shooter in the school at different times, different places, so people keep it in the back of their mind monthly, like fire drills, what to do just in case,” said Rentschler. “In spring of 2018, everybody obviously had a heightened awareness of their district protocol, their emergency operating plans and so forth, and we did a tabletop exercise with local emergency management people all throughout Allen County and even Bath Township, and we went through some exercises here and kind of fine-lined our protocols and processes and looked at some areas,” said Dakin. School resource officers also play a role in security for several districts. “We have school resource officers in every single one of our buildings. They’re vital to what we do. They do so many more things than just keep our building secure. They work in the role of mentor, counselor, just somebody kids can confide in, a trusting adult, all of the while making sure that they keep all of the bad things out of the building,” said Garlock. “We are in discussions with Sheriff Treglia and we’re trying to get a contract worked out so we can get an SRO out here for us because we’re on an island out here by ourselves. We don’t have any police officers at all. We do want somebody in the building with a gun. We’re not comfortable right now in having teachers do it,” said Rentschler. “We are currently in talks with the board of education about securing a school resource officer for next year. We will be looking at doing that over the next month or two and making a decision to have a resource officer on grounds every day,” said Dakin. Funding some of the needed security improvements will be up to voters. “In May we’re running a one mill levy that would create $400,000, and that money would be used to add three additional resource officers. We currently have one, but that one officer travels among the four buildings. So this would put a resource officer in every building. It would give us an additional mental health counselor because as we saw in Parkland, a lot of that goes back to mental health, and we only have one mental health counselor for 3,300 students, so we would like to add an additional mental health counselor. Then the final piece of that levy would pay for additional security upgrades, anything we would like to do with our camera system. We need new servers for that. They could help pay for things like the notification system, so that will be on the ballot May 7, and we’re hoping that the community sees value in it because the main goal is to just to provide more protection for our kids and our staff. Keeping kids safe is one of the most important things we can do,” Rex added. Allen East has also taken the step of eliminating school counselors. “We’ve gone straight to social workers because we’re trying to be real proactive and catch kids who have mental problems before they do something that’s going to harm all of us. In all of the shootings that you’ve seen, there are signs that these kids had mental instability and it should have been caught by the school, so we have two full-time social workers on staff here that do a great job working with our pre-K through 12 kids to help them with suicide prevention, help them with mental disabilities and those sort of things,” said Rentschler.